Enjoy a luxurious experience in a beautiful setting Corbett Fun resort is located quite close to the Corbett national park. A luxury property, it offers great facilities at reasonable prices and even provides sightseeing assistance to the guests. The Bharatpuri Mandir is 4 km away from the resort while Nainital is located around 31 km far from the resort. River Kosi lies at an easy distance of 2.5 km from the property. Religiously inclined tourists can visit Kalika temple, which is 4.5 km away. The angling place is located at a distance of approx 5 km. The Ramnagar railway station is 6 km away from the property. The nearest airport is Pantnagar Airport which is 53 km from the Corbett Fun Resort. The Corbett Fun Resort has a travel desk to assist you in making your tours and sightseeing plans. A spacious parking area is available for guests to park their vehicles. Doctor-on-call service can also be availed in case of emergencies. Laundry facility is provided for a minimal charge. 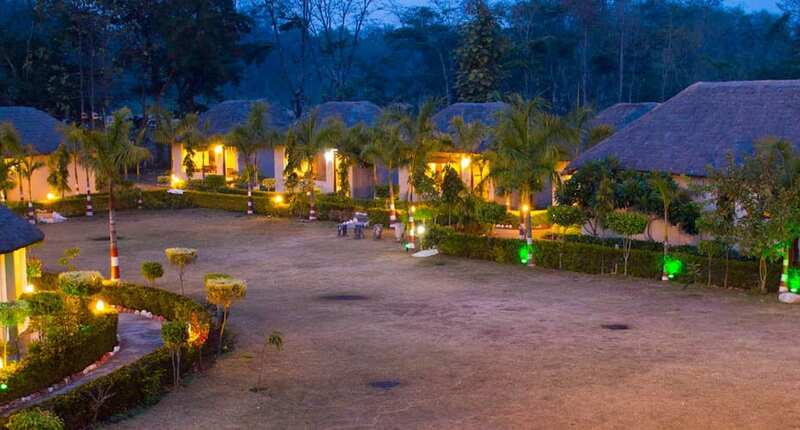 The Corbett Fun Resort has 15 decorated cottages located in the lap of nature. Divided into three categories namely Pool cottage, Jungle cottage and Garden cottage, every cottage comes equipped with amenities like LCD TV, 12-hour hot and cold running water, room heater on request, coffee maker and telephone. The multi-cuisine restaurant of the resort has an in-house restaurant which offers a variety of food. With room service, you can enjoy all the delectable dishes in the comfort of your cottage as well. What makes this property the first choice among travelers is its exceptional setting and excellent services. Reason For Rating : Hotels approach road was not available, it is very near to corbet get. Only jipsy vehicle can reach up to hotel. Our car had difficulty to reach to the hotel. There is no board of hotel on the way. Otherwise its very good resort property with nice garden and villa with pool facility so we can enjoy to stay here. And food quality was good not bad. Staff service is nice. As earlier I said only negative point is how to reach this hotel otherwise there are many positive points . Reason For Rating : Good resort at a good location. Very nice staff ready to help at all times. Amazing food, Amazing service, Awesome exteriors money well spend . Rooms needs some restoration, specially in terms of lightening as most of the bulbs were not working and even intercom was not working . Bathroom needs a fix too as shower was kept on turning off. They also need to enforce strict rule on swimming pool allowing anyone without swimwear will make pool water contaminated fast and people were not even taking shower. Or start cleaning Twice in a day. Overall nice stay n would definitely recommend if you are looking at sitavani enterance this is the place to stay. Fun in all the real sense!! The weekend trip to Jim Corbett wasn't planned at all, me and my friend had planned a trek in Uttarakhand but given the traffic conditions on our way, we took a detour to Corbett. So here we were, at 8.00 am in the morning at Jim Corbett with no reservations to stay and no idea on the upcoming itinerary. We started looking out for resorts and not to our surprise they were all booked. We were asked to visit Fun resort saying they might have just 1 room left. Without any further delay we just rushed to the location. The resort has no big hoardings or banners listed, but if you ask around pretty much anyone can give you the correct direction. We were welcomed by refreshing drink and happy faces and directed to our room. The property is very well maintained with lush green lawn that opens up in front of every room. The rooms are spacious. And the buffet [breakfast, lunch and dinner] is very homely in taste. Every staff has a smile on his face and will go an extra mile to make sure your stay is perfect in all aspects. Special note of thanks to Mr. Prem who made sure we are treated with utmost care and we have all the fun on our unplanned weekend trip :) Mr. Kundan for being there to make sure all the required things are provided to us on timely manner. If you are looking for a place away from the hustle bustle of the city, then this is where you need to be. Agr Aap Jim corbett ja rahe ho to "corbett fun resort" hi book kariye kyoki eski food quality, cleaning, services, sb bahut achhi hai sath hi sath eska location bahut mst hai. Nice place, nice resorts. This hotel is very beautiful and nice hotel for family. Mai aur meri puri family es hotel me stay kiye the inki services bahut achhi hai aur food quietly my all family member ko bahut achha laga tha aur hotel ka location bahut achha hai just behind the Kosi barrage in the Jungle area. except pool rooms all rooms facing to garden are same. one can go for anyone. All rooms are common, although they have segregated them in three categories just to loot.